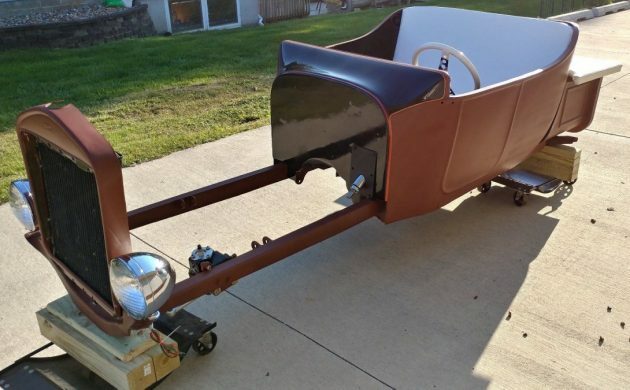 I can’t help but feel that someone is going to be in the right place at the right time, and that they will give this Model T project a new home. 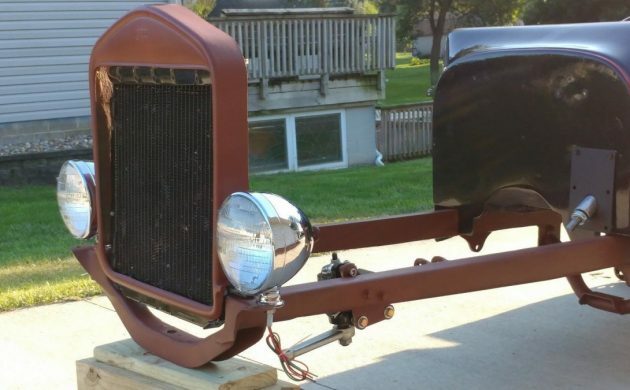 Listed for sale here on eBay, this project car is located in Des Moines, Iowa. 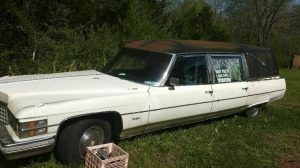 It comes with a clear title and a BIN price of $4,000 but the option is there to make an offer. 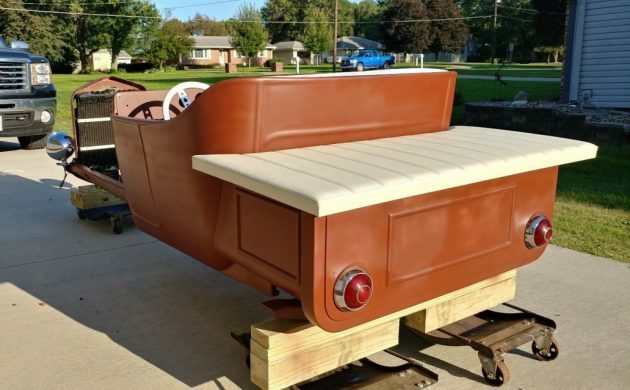 As blank-canvas projects go, they probably don’t come a lot better than this Ford. The body appears to be dead straight and in excellent condition. Everything appears to be present and ready for the new owner to finish this car in the color of their choice. Thanks to the fact that the interior trim is very neutral, the new owner could pick any color off the spectrum to finish this car. Having said that there will be some detail work required for areas like around the radiator and grille to achieve a nice finish. The interior is essentially complete, with a freshly upholstered seat, carpet fitted and that rather cool steering wheel. The floor has been set up for a shifter as the car has been configured ready to accept a small block Chevy engine and TH350 transmission. 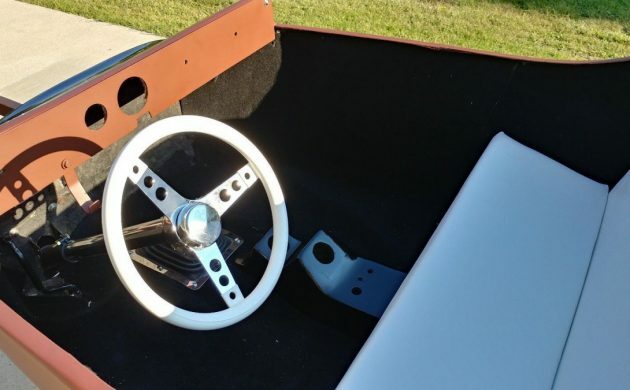 The dash may also require some modifications and additional holes as you will see. 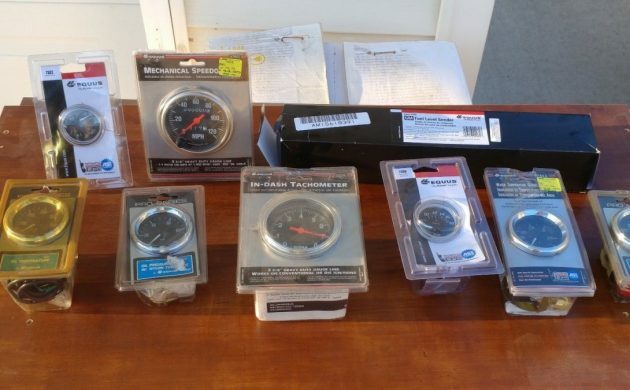 The seller includes this array of gauges for fitment to this Ford. There is also a fuel gauge sender there, but all of this exposes another task that the new owner will need to address. This project comes with no wiring of any description. It will require a full wiring loom to get it mobile. These are available to purchase specifically for this task, so hopefully that won’t cause any issues. There are also some nice detail and mechanical components included with this Ford. Those chrome headlights certainly look the part. 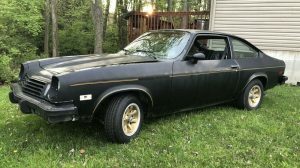 The car also features a Vega steering box, shock mounts, springs, a polished stainless steel steering column and chrome windshield posts. There is also a set of finned Buick drums and a front axle. To me this Model T represents quite decent value for money. 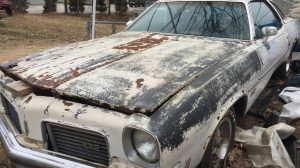 This is an opportunity for someone to buy a car that is a blank canvas to build a hot rod or a rat rod, and to not have to worry about the hassles of restoring a body or chassis before they can even commence the build process. 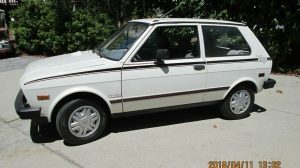 It is also a chance for someone to buy this project and build the car of their dreams at an affordable price. Those opportunities don’t present themselves every day. I don’t know if I can’t visualize it correctly…but seems like there is a lot of space from the cowl to radiator shell. So it wasn’t just me. It looks like you could stick two SBC’s in line between the cowl and the Radiator. Maybe he was inspired by this? Agreed about the space for the Mill. You can buy a turnkey t bucket relatively cheap, You would be way over that for this one at 4 large. couldn’t finish for 10, IMHO. maybe the guy left extry room for a BBC. The frame looks very delicate to be able to take a SBC or two. What is going to stop it from twisting when flooring the gas pedal? You guys are making some good points, this is the kind of deal that’s pure sucker bait for the inexperienced, build it from the ground up, guy. As such it could be a good teacher project for a “man, I didn’t think it would be that much money and time” thing. The inexperienced will argue with that, the experienced will nod in agreement. Such is the cycle of life. BTW, that’s a glass ’23/5 bucket so in some states that claimed title might not fly. I quick check on eBay will show that turn key T-buckets often sell for well under $10,000. Uncle Bob, I have a great idea , every Barn Find that has anything to do with early Fords 28 to 48 ,or Hot Rods and their history, only one of us should comment, because we both say the same thing. It would save the readers and us allot of time. 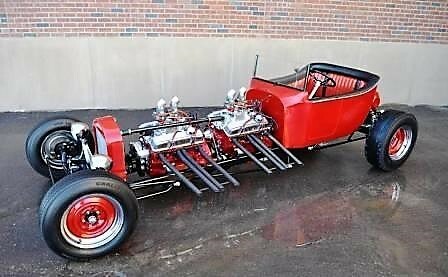 Side Bar on T-Bucket, you love them,” IF”, you have never owned one, driven one, or rode in one, or better yet tried to sell one! Oh Joe, you always have additional info to share so wouldn’t want to limit what gets out there. Your comment about “love them” is a slice of informed view not said by anyone else on this thread. I enjoy it anyway……….. 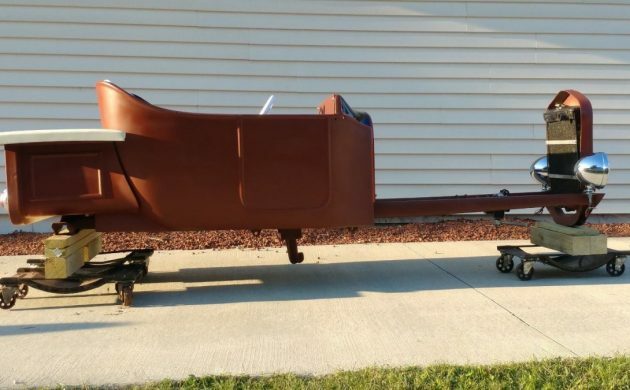 There is a nice left side shot on the Ebay posting and it loos like the body needs to be moved forward a few inches to fit correctly. I’m not a rod builder but it looks like there is too much overhang in the rear. If I’m correct then that would close up the gap between the cowl an radiator a little. But I’m not sure if that would be enough to make everything look correct. Not sure how familiar with proportions on this type of car Gary, but the rear transverse spring centerline is through that rear cross member (in line with the wood blocks). Typically the axle would be hung slightly ahead of the spring approximately 3 to 4 inches, so the tailgate would still be short of the back line of the tire figuring something around 31″+/- . Moving this body any further forward would look odd to most eyes. How about a ford 300 6 for that long front end ? That’s what I was going to say or a straight 8 Buick engine. I don’t like how spindly those frame rails look I’d be doing somthing with that. I’m not a hot rodded so I wouldn’t be interested anyway. Based on the gap, it appears the best engine choices would be a Cadillac or Marmon V16, or an Allison V12. However, I’m not at all sure that the T frame would hold any of those because of their weight, torque and/or power. Frame’s got to be beefed up for the power plant anyway… length could be adjusted then without a lot more work. Thats the spring perch in the rear… not much moving you can do with that. Have a ? I have a complete 84vette (basket case) good chassis, bet you get what I’m thinkn ? ! ! All that space up in the front. I think there’s about enough room to put a horse, or maybe a mule with enough room left over for a couple chickens. One thing’s for sure, you’ll be the only one at the show with a one horsepower hot rod. I think a couple of those gauges actually almost match. about 4-6 inches towards the rear? Radiator is too far forward; radiator is too high (top of grille shell should be equal to top of cowl; That is a 1923 car, NOT a 1927. I usually use worms to fish for suckers. That price is just too high. How in the world does he justify that? I’m gonna get strung up for this but here goes. These don’t do much for me. They’re cool, in an old school Americana sort of way, but there’s not much model T here. It’s a Frankencar, that kinda resembles a model T, sorta. When you squint. Gotta put something on the title I guess. At least don’t do a “rat rod,” please. Stroke a 351 Ford, shoot a nice black with ghost flames and go play Happy Days.